The Cat Tree Panther is a super sturdy piece of kitty architecture that has been finished in a gorgeously cosy creme / beige colour..
With seriously chunky 12cm thick sisal scratching poles connecting the entire cat tree together, your feline friend will have all the space in the world to explore and play! The cat tree panther stands at a whopping 173cm tall which offers your feline a majestic height to watch the world go by and feel safe and secure as they survey their surroundings. This is a brand new model f or 2017 as has been given the gorgeous makeover due to the softer plush material and the cosy hammocks which have been given a luxuriously soft filling! The strong base plate ensure the cat tree remains erect at all times and this product will stand the test of time for many years to come. Unlike some of the cheaper models which are available and made in China, the Cat Tree Panther has been built to the very highest of European standards. 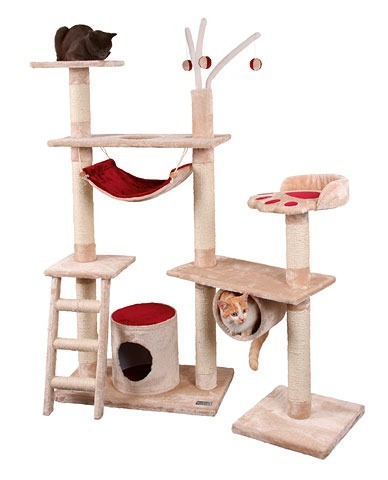 So, you can be sure that you are investing in a strong and robust cat tree that will be able to handle everything your crazy kitty throws at it. Your kitty will simply love to climb the sisal poles or take a blissful ‘cat nap’ in one of the hanging mats. The penthouse snuggle bed is the puuurfect place for your kitty to kick back and relax and settle down for a much needed snooze. Total 64 KG. Very steady and sturdy construction. Sisal posts: 12cm diameter with natural sisal. My cats are in. love!! Not only is this an amazing cat tree but my experience from beginning to end has been flawless and just want to thank all of the team for keeping me up-to-date with my delivery and we are all very very pleased with the result! It looks great!! I totally agree with the above reviews this really is miles above anything else that I’ve purchased before and I do appreciate it is a lot of money to spend but frankly I’m sick of replacing cheaper models which I’ve purchased before. This is made to last and so pleased that I came across this company! About time!! Unfortunately there was a slight delay with the delivery of these products. I can’t blame Cat Tree UK for this, and to be fair they did resolve the matter very promptly. Altogether I am very impressed with the quality of the product and it was worth the wait! This really is a superior product and well worth the extra spend. We too have had numerous cheaper versions only to find that they just couldn’t withstand any level of wear and tear from our four Ragdoll cats and consequently would very quickly need replacing. This tree is strong, robust and luxurious. The cream upholstery is great quality and appears unlikely to shed bits of fluff, It also blends seamlessly with our lounge decor. Ordering was straightforward, delivery prompt and assembly easy. Fabulous – Thank you – the cats love it!